The last half of the 20th century saw the fastest ever evolution in ship development, with size increasing tenfold, more new ship types and the container revolutionising general cargo transport. On the naval side, the nuclear propelled submarine changed warfare for ever, both strategically and tactically. Postwar recovery saw a booming world economy, with oil replacing coal as the primary energy source. Tankers increased dramatically from the ‘three twelves’ of prewar (12,000dwt at 12knots on 12tons oil per day) to the first 50,000dwt in 1956 to the 200,000dwt Idemitsu Maru in 1962 culminating in the 550,000dwt giants of 1976 like Shell’s Batillus with a draft of around 28m ­ although the latter class proved too large and inflexible in service, and none remained in service long. 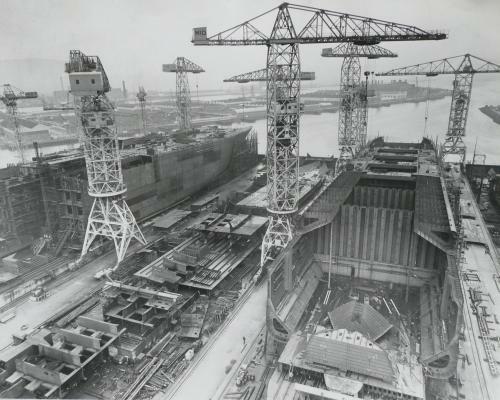 Nearly all such vessels were built in building docks, some spanned by gantry cranes of up to 1000tonnes lifting capacity, enabling very large blocks and complete superstructures to be lifted. Ports expanded continually to accept such large vessels, with a corresponding demand for dredgers, usually suction, capable of as much as 30m (100ft) depth. A particular enabling technology was computer aided design (CAD), initially used to mechanise tedious naval architectural hand calculations from the late 1950s, but soon applied to structural analysis where finite element methods allowed ever larger tankers to be designed with greater confidence. In due course CAD was linked with computer aided production methods with full product models associated with numerically controlled machine tools. The fourfold increase in oil prices in 1974 not only halted the growth of tankers but encouraged the search for offshore oil. While jack-ups were adequate in shallower waters, drilling in deeper waters required semi-submersibles. Motion analysis programs were essential, and coupled with dynamic positioning using thrusters, resulted in increased operability in all manner of offshore vessels. Many of these vessels had helicopter landing decks, as did most major warships from the 1960s. The bulk carrier concept of a single deck vessel with hoppered holds was not new, as it had been used in short sea gas and electricity colliers for decades. But it was not applied to deep sea ships until the late 1950s, although deep sea iron ore carriers with their small central cargo holds dated from the 1920s. The bulk carrier design was ideal for grain and ore cargoes, which hitherto had been mostly carried in tween-deck cargo vessels. Size grew steadily from the initial 15,000dwt to over 100,000dwt by 1968 although the 60-70,000dwt Panamax proved popular with a breadth of 104ft, later 106ft (32.2m), to get through the locks. The development of the combined carrier (ore/oil or ore/bulk/oil) in the late 1960s proved popular initially, offering the ability to switch cargoes between voyages, either to reduce ballast steaming or to take advantage of higher freight rates in the other market. But by the 1990s disadvantages outweighed advantages, with requirements for double hulls and high standards of hold cleaning between oil and dry bulk cargoes, so that few have been built since then. Although the smaller bulk carriers had their own cargo handling gear to enhance their ‘go anywhere’ capability, initially derricks then cranes, the bigger ships carried no gear, trading as they did between relatively few ports handling iron ore and coal, so relied on shore gear. Figure 11. The single deck bulk carrier developed quickly in the 1960s as far more suited to cargoes like ore, coal and grain than tween-deckers. This view of 76000dwt Essi Kristine under construction at Harland & Wolff’s Belfast shipyard in 1967 shows the now classic hoppered hold shape with topside wing tanks. To the left is an early VLCC, Shell’s Myrina of 190000dwt. Such vessels were difficult to build on conventional slipways, so shortly afterwards H&W built their 556m x 93m building dock in the Musgrave Channel, immediately behind the tanker, with one (later two) 840ton goliath crane spanning the dock, permitting much larger prefabricated units than was possible with the berth cranes seen. Such building docks were widely constructed from the mid 1960s, usually in ‘greenfield’ shipyards ­ but often actually land reclaimed from the sea. The late 1950s and 1960s saw a great increase in specialist ship types, as demand for large volumes of cargoes like export motor cars justified a tailor-made design rather than a general purpose ship. The growth in car exports initially from Europe, later from the Far East, brought about the pure car carrier, a floating multi-storey car park initially capable of carrying about 1000 cars, but around 8000 today. The first purpose-built chemical (parcels) carrier was Marine Dow-Chem built in 1954. Chemical resistant tank coatings such as epoxies and zinc silicate and some tanks built of stainless steel allowed a huge range of chemicals to be carried in bulk in a single ship. That also required the development of segregated pumping and piping systems, so that the submerged (deepwell) pump was born, hydraulically driven from the deck. Liquefied Petroleum Gas (LPG) carriers were another 1950s development, where cargoes like propane could be liquefied either by cooling to about -48oC, or in smaller tanks by pressure alone. A more demanding technology was required for Liquefied Natural Gas (LNG) which liquefies at -163oC, so having heavily insulated tanks separate from the main hull structure. The first purpose built LNG ship was Methane Progress of 27,400m3 with aluminium alloy tanks in 1964. Spherical tanks were developed by Moss-Rosenberg, but the most popular design proved to be the membrane tank, a prismatic tank with a thin cryogenic lining supported all around by insulation and a secondary barrier (in case of LNG leakage causing brittle fracture). LNG carriers plateaued in size at around 130,000m3 for over two decades, but in recent years have broken the 200,000m3 barrier. Such vessels were for long the last outpost of steam turbine technology as the boil-off gas could be readily burned in the boilers. More recently diesel-electric machinery plus reliquefaction plant has been used. The impetus for specialist ships comes when the volume of a particular trade expands to a level sufficient to support a custom-built fleet. Although specialist port facilities are also required, the increased efficiency and improved quality of cargo outturn outweigh the lack of flexibility for alternative cargoes. Flexibility was the key attribute of the general purpose (multi-deck general cargo) ship, which dominated such trades for over a century. It was the inefficiencies of the latter that spurred the development of the container ship to speed up general cargo handling, eliminate labour intensive methods and reduce port time from a week or so to a day or so. Although early vessels developed for Sea-Land’s US coastal trades were based on road trailer dimensions (but using the cellular stowage principle), standardisation of container dimensions by ISO in 1965 paved the way for its widespread adoption. The now ubiquitous 20ft and 40ft boxes (no-one talks of 6.1 or 12.2metre containers) allowed mechanised handling and stowage processes and equipment to be developed, ranging from gantry cranes to container spreaders to straddle carriers to lashing mechanisms, as well as intermodal transfers to road and rail vehicles. Steel hatch covers were designed to take containers stacked on them; today up to half the container load can be stowed on deck, the rest in cell-guides in the holds. Such was the increase in productivity from larger faster container ships that one vessel replaced five or six break-bulk vessels, so all the main trade routes had been containerised by the mid 1970s. Since then the 3000 TEU (twenty foot equivalent unit) ship has grown to 14,000TEU, although speeds have remained in the mid 20s knots. Following oil price increases, the steam turbine container ships of around 80,000shp (60MW) of the early 1970s gave way to slow speed diesel ships, with engines now available with up to 115,000bhp (85MW) with 14 cylinders on a single screw of around 10m diameter. Figure 12. Standardisation of container dimensions and fittings in 1965 enabled the widespread adoption of containerisation, slashing port time for general cargo ships so permitting much larger ships. The deck stow roughly doubled the number of containers carried in the holds. 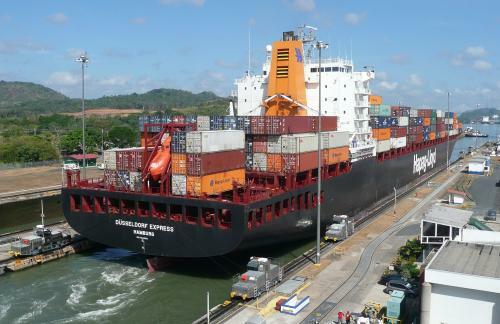 Until the 1980s, such ships were designed to the limits of the locks of the Panama Canal (built in 1914), corresponding to about 4600TEU (twenty foot equivalent units), the size of Dusseldorf Express seen leaving Miraflores Locks. Ships of three times that capacity are now in service, which will be able to transit the third set of locks due to open in 2014. It was in the 1950s that the use of turbocharging in 2-stroke diesels (previously in 4-strokes), heavy fuel oil and cylinder bores approaching 1000mm enabled the slow speed direct drive engine to challenge the steam turbine in bigger ships. That remains the prime mover of choice today, although the emphasis is now on reducing emissions which require higher quality fuel. Medium speed diesels had been developed between the wars (sometimes based on submarine or locomotive diesels), and post-war were widely favoured in smaller vessels and in low headroom ships like ferries, usually geared rather than direct drive. The short sea roll-on/roll-off vessel evolved from the Second World War tank landing ships in the 1950s. They offered big reductions in port time where trailers could be used, as well as providing a drive-on/drive-off facility for cars and trucks. These required innovation in cargo access equipment, with external and internal ramps and elevators. The same concept was applied to deep sea ro-ros in the late 1960s carrying cargoes such as forest products and containers, block stowed on the decks or on trailers. But after two decades of competition, the cellular container ship won out, partly by being better suited to the hub-feeder concept, with large mainline ships serving major ports like Rotterdam supplied by smaller feeder container ships from secondary ports. There had been great expectations from barge carriers from the late 1960s, with lift-on/lift off concepts like the 380dwt LASH (Lighter Aboard SHip) barge and even a few float-on/float-off designs. While loading or discharging the mother ship could be done in hours, the cargo still needed handling to and from the barge itself, perhaps at an upriver berth. But the mainly low value commodities that could move in 380-ton parcels could not support the high costs of the operation, so by the late 1980s nearly all barge carriers had been converted or scrapped. Post WW2 deep sea passenger vessels continued to be built in significant numbers. Innovations such as stabilisers and later bow thrusters made for a more comfortable voyage and easier manoeuvring. Bulbous bows were often fitted, tuned to their relatively high Froude number and near constant draft ­ later bulb shapes were developed for a much wider range of hull forms and drafts. Aluminium superstructures were introduced in the mid 1950s, which allowed an extra deck to be fitted without jeopardising stability, as well as doing away with troublesome expansion joints. But long distance passenger sea transport had been overtaken by air transport by the late 1950s, so by the late 1960s all the large liners had been scrapped or converted to cruising or become museum ships, as Queen Mary at Long Beach in 1968. But as that door closed, another opened, the purpose built cruise ship (not ‘cruise liner’, as they do not operate on a fixed route). Pioneered by Scandinavian owners, ever larger and more luxurious floating leisure centres developed into today’s 150,000gt plus monsters carrying over 4000 passengers ­ the 200,000gt/6000-pax barrier was broken in 2009. Technical problems requiring solution included structural integrity and safety with large open spaces like atriums, hotel electrical loads comparable with propulsion loads leading to diesel-electric systems, multiple thrusters (including stern as well as bow) and podded propulsors, improved fire protection, lifesaving appliances and subdivision. Figure 13. Spanning almost the entire century and a half, high speed catamaran Normandie Express passes preserved ironclad Warrior (right) at Portsmouth in 2008. Both are about 6000tons gross. Warrior was built in 1860, iron hull, 5470 ihp steam reciprocating machinery with single screw, 14 knots and rendered obsolete wooden walled battleships. Normandie Express was built in 2005, aluminium hull, 38,500shp medium speed diesels with four waterjets, 42 knots, 850 passengers, 235 cars. Transport of passengers is today focussed on short sea and local ferries, with a huge variety of designs, usually including vehicle transport. Sizes now exceed yesteryear’s deep sea liners, 50,000gt being not uncommon on some European routes, at over 20 knots. From the 1960s, high speed craft began to challenge conventional ferries on short routes, initially air cushion vehicles and hydrofoils with speeds of 35-50 knots. With their inherently low lift/drag ratio, light alloys were needed to keep hull weight down and gas turbines were often used to provide the high power. Steady growth has continued, with some craft now carrying around 1500 passengers and 400 cars at speeds of over 40 knots. But it is the catamaran concept that dominates the fleet today, where two slender hulls offer low drag while the bridging structure offers space. Medium speed diesels have often proved more economical than gas turbines, with both types of prime movers coupled to the ubiquitous waterjet (up to four). Freight-only high speed craft have yet to challenge conventional ro-ro’s on short sea routes. On deep sea routes, the problems of seakeeping, large fuel load and cost, and low payloads await enabling technologies to improve lift/drag ratio and fuel consumption significantly ­ a problem that early aircraft also faced. Figure 14. 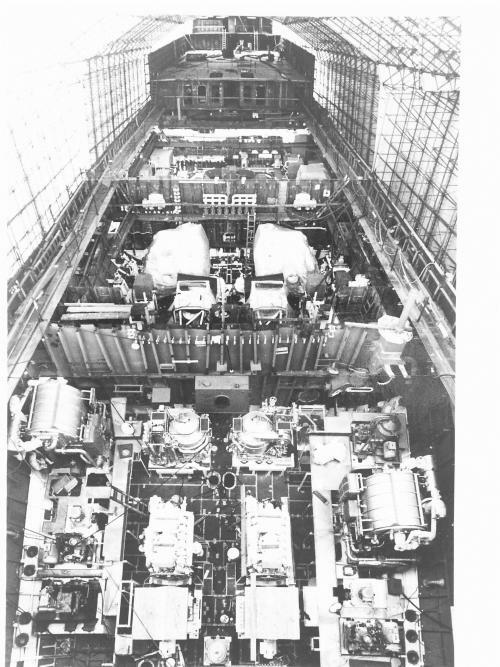 Gas turbines were an important enabling technology for fast warships, permitting high power in a compact space, with lesser manning and maintenance from the 1970s. With gas turbines being of lower efficiency at modest cruising powers, it was common to fit two gas turbines per shaft, one for boost to around 30 knots, and one for cruise up to about 20 knots (sometimes diesel). The frigate Sheffield has three machinery spaces. Nearest the camera is the Aft Auxiliary Machinery Room with two diesel generators in the centre, two auxiliary boilers in front of them with auxiliary machinery modules and distillation plant at each side. The middle compartment is the Aft Engine Room, showing the two 5000shp Tyne gas turbines and forward the much bigger gearboxes. The further compartment is the Forward Engine Room, although the two 25,000shp Olympus gas turbines are barely visible. Gas turbines have been the prime mover of choice for most high speed warships from the late 1960s, derived from aircraft jet engines, although the first seagoing (industrial) gas turbine was fitted in a British torpedo boat in 1947. High power-weight ratio, compactness, repair by replacement, reduced manning and quick starting have for military vessels outweighed the disadvantages of high fuel cost, few frame sizes, lack of reversibility (usually achieved by controllable pitch propellers), large uptakes and downtakes, and possible salt spray ingestion. Electric propulsion technology with high power density motors has increased the number of ships with full electric propulsion, especially those with a wide range of power demands, whether naval, commercial or offshore. Azimuthing thrusters have become the propulsor of choice for tugs, two giving great manoeuvrability under one-man control, hence a smaller crew. While some high speed craft have been built of fibre reinforced plastic, a much larger market has been in mass produced leisure craft, where low maintenance has been an advantage. Its non-magnetic properties encouraged the use in mine countermeasures vessels from the mid 1970s. Fishing vessels have been built in the widest range of materials, also including timber and ferro-cement, but the stern trawler offering safer operation for the crew is usually built in steel. Supporting technologies have had a collective impact on ship performance. Self polishing tin-based co-polymer anti-fouling coatings in the 1970s provided smoother longer life protection, a capability now offered by foul release (non-stick) coatings since the ban on TBT-based coatings in 2003. Inert gas systems for hydrocarbon cargo tanks from the 1960s improved the safety of tankers, based initially on scrubbing flue gases from boilers. Automation starting with auto-pilots has reduced crew number down to half a dozen on coastal vessels and around a dozen on some deep sea ships with dual trained deck and engine crews. Improved navigating aids have helped reduce ship casualty rates, although both the quantity and quality of experienced seafarers continues to concern ship operators ­ airlines do not have similar problems. Full integration of technical and commercial requirements to optimise ship voyages and port performance each day to take account of internal and external conditions (including weather and fuel prices) is now within reach. But perhaps the most pervasive recent technical influence has been the ever increasing regulatory demands and standards. Coordinated by the International Maritime Organisation, the intent is to achieve international agreement before implementation by individual flag states, e.g. ballast water treatment. Classification societies, concerned with the integrity of hull and machinery systems, have expanded in number. The International Association of Classification Societies (IACS) tries to coordinate technical requirements through such means as Common Structural Rules for tankers. But the marine industries have for historical reasons had more fragmented regulatory regimes than land based national industries, so adoption of readily applicable best practice takes time. So perhaps what the marine industries need in the next decades is to focus enabling technologies on getting the best out of well established concepts like bulk carriers and diesel engines by improving operational efficiency and mitigating potential hazardous and environmental impacts of ships, but without jeopardising the technical and economic gains of the last 150 years, i.e. optimising benefit-cost ratios, not purely in monetary terms. The professional institutions have a continuing role in discussing and disseminating the best ways forward, largely using the English language, now universally adopted in the maritime industries.